Calling kids...of all ages! Here's a great outing in the foothills about 30 minutes from Denver. Just off I-70 at Genesee Park, exit 254, lives a large herd of bison (buffalo). Part of the City of Denver Mountain Park system, the buffalo herd is fed every day. You can usually see them on either side of the freeway. Small parking lot adjacent to viewing area. In 1914, Denver bought seven buffalo from a small wild herd in Yellowstone Park for their newly purchased game preserve in the mountainous Genesee Park close to Denver, the start of the herd you see today. In the early 1800s, when people were pouring into the West by the droves, 30-60 million buffalo were roaming the plains west of the Mississippi. A combination of settlers and solders tried to eliminate the Native Americans from attacking their homes, forts and travelers by getting rid of their food supply. By the late 1890s, and even more reckless slaughter of buffalo by man for sport or fun, brought down the number of buffalo remaining on the plains to an estimate of only 500. Immediate action was then taken by the government and other agencies to preserve this American Heritage. 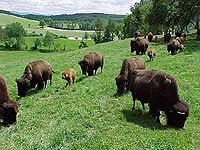 Today, the estimate of about 1 million buffalo roam on private and public land in Canada and the United States. Buffalo or Bison? Common usage makes the word buffalo and bison interchangeable; however, the American Buffalo is more closely related to the European Bison or Wisent and the Canadian Woods Bison than it is the Water Buffalo of Asia or the Cape Buffalo of Africa. The scientific name, Bison-bison, belongs in the Bovidae family of mammals. You guessed it, cows! Recommended reading for children before you go: Nickel, the Orphaned Buffalo. Continue your journey into our American Western past and hop back on I-70 east to, exit 256, follow the signs to Buffalo Bill's Grave.